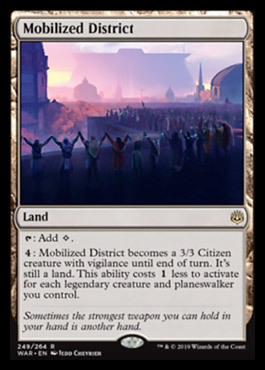 Ability Text: T: Add C. 4: Mobilized District becomes a 3/3 Citizen creature with vigilance until end of turn. It's still a land. This ability costs 1 less to activate for each legendary creature and planeswalker you control. Flavor Text: Sometimes the strongest weapon you can hold in your hand is another hand.